Cypress Boardwalk. Photo by Jennifer McBride via Flickr. View from chickee hut. Photo by Jennifer McBride via Flickr. Alligators and vultures on SWA trails at Grassy Waters Preserve in West Palm Beach. ~ WEST PALM BEACH — It’s hard to find good hiking and biking trails in paved-over South Florida, and that’s what makes Grassy Waters Preserve in West Palm Beach special. It’s a 20-square-mile wetland whose primary purpose is to provide drinking water for the city of West Palm Beach. But the city has made good use of the preserved land by developing outstanding recreational features — a boardwalk trail through a cypress swamp as pretty as any you’ll ever find, plus more than 20 miles of additional trails, most suitable for hiking and fat-tire bikes. The boardwalk trail is just under a mile long and takes you past a staffed nature center, where you can get detailed trail maps for the rest of the preserve. What I love about the boardwalk is that it has very low rails, so that if you’re pushing a wheelchair or stroller, the rider has excellent visibility. This is a great trail for families, as there are inviting rocking chairs situated under chickee huts along the way — magnets for kids. We’ve seen an alligator and wading birds along this shady trail that is brimming with ferns and air plants. Even if you come for the longer trails, don’t miss this one: It’s just too pretty. The longest trail is the Owahee Trail, 16.6 miles along the preserve’s perimeter. The several-mile sections we walked were actually hard-packed sand and dirt roads on the levee. The trail is good for mountain bikes not for thin-tire bikes. The area is full of wildlife. On hikes in two separate stretches, we saw alligators, deer, roseate spoonbills, various herons, hawks and more. The best place to start this hike is where 45th Street ends at the preserve, where there is a large parking lot. If you walk or bicycle south on the Owahee Trail at this point, you pass some of the best birding plus several boardwalks into the wetland. 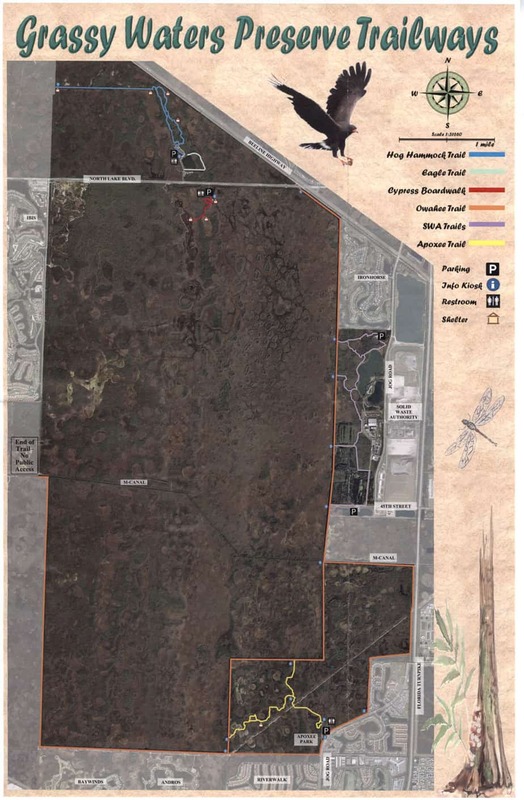 The SWA property itself has four miles of hiking trails around its headquarters that connect to the Owahee Trail. The SWA trails may suffer from a landfill smell at times, but they are full of wildlife. A large wading bird rookery flourishes here. (Trails may be closed during nesting season in spring.) We saw at least a dozen alligators lounging. A bicyclist advised us to head down one trail that was a little too wild for us — there were hundreds of black vultures overhead and the ground was littered with bones from their feasting. We didn’t get far. It seemed with that many big birds overhead, we were likely to get our heads and shoulders decorated. There are also several miles of good hiking trails at another Grassy Waters trailhead, 8537 Northlake Boulevard, across Northlake Boulevard from the Cypress Boardwalk trail. Hog Hammock Trail is a 2.8 mile trail suitable for mountain bikes and hiking. At its farthest end, you can add the Promontary Trail, which is 1.2 miles out and back. The total hike is about five miles and includes some good sweeping views of the landscape, beautiful shady trees and some board walks over cypress swamp. On the day we hiked, these trails had attracted several bicyclists. At this same trailhead, it’s also worth taking the Eagle Trail. A half-mile out-and-back along Gator Lake is a narrow, twisty trail. (Not for bikes.) There are limestone outcroppings underfoot and a few nice lake overviews. The trailhead at 8537 Northlake Boulevard has good facilities for picnics and includes a clean restroom. At a third trail head, you can explore Apoxee (“beyond tomorrow” in the Miccosukee language, pronouned A-po-hee) Park, which is on the west side of Jog Road one mile north of Okeechobee Boulevard. It has 2.5 mile trail through a wetland hammock and pine flatwoods. This trail can get wet and muddy after heavy rain. Visitors, though, say wildlife is plentiful — alligators, turtles, birds, deer. It connects to the south end of the Owahee Trail.